It has finally arrived! 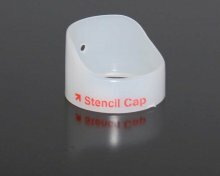 Sick of making your own stencil caps? Sick of wasting time to make one that works like crap? Here's the answer. At first we were skeptical, but this thing totally rocks! It works perfectly every time to give you the ultra-fine lines that standard caps just can't compete with. They last a lifetime if you take care of them, so order one or two today and get those razor-sharp edges that you've been craving.